The International AIDS Society (IAS) held their 22nd international AIDS conference (AIDS 2018) in Amsterdam 23-27 July 2018. This year, the conference objectives focused on advancing knowledge of HIV through research findings, promoting evidence-based HIV responses tailored to key populations, activating and galvanizing political commitment and accountability, addressing gaps in and highlighting the critical role of HIV prevention, as well as spotlighting the epidemic and HIV response in Eastern Europe and Central Asia. 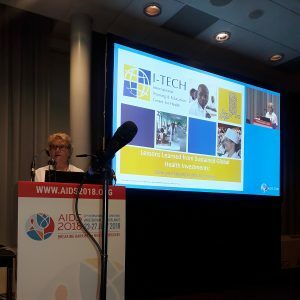 Ann Downer presents her abstract, “Lessons Learned from Sustained Global Health Investments” at AIDS 2018. Ann Downer, EdD, I-TECH Executive Director, was a presenter during the session, “Keeping it Up: National Ownership and Financial Sustainability,” on 25 July 2018. Dr. Downer presented lessons learned from sustained global health investments using six past case studies of I-TECH programs successfully transitioned to local ownership. Phiona Marongwe, diploma in nursing, BSc, Program Officer for the Zimbabwe voluntary medical male circumcision (VMMC) program, presented her poster, “Trust But Verify: Is There a Role for Active Surveillance in Monitoring Adverse Events (AEs) in Large-Scale VMMC Programs?” The poster looks at passive versus active surveillance of monitoring AEs following VMMC. 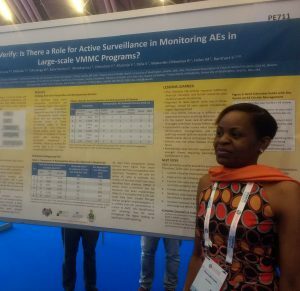 Phiona Marangwe discusses her poster, “Trust but Verify: Is There a Role for Active Surveillance in Monitoring AEs in Large-Scale VMMC programs?” at AIDS 2018. This abstract highlights two strategies that were employed to increase HIV case identification among men at 26 public health facilities in Botswana: extended-hours testing and use of a warm-line for scheduling testing appointments. This abstract explores Botswana’s experience of adapting the WHO HIV Testing Services (HTS) Guidelines, a significant step in reaching epidemic control of HIV, demonstrating the nation’s commitment to rigorous strategies that ensure all Batswana know their status and have timely access to prevention and treatment services. “Adaptation, Implementation, and Evaluation of a Tele-Mentoring Program for the Namibia HIV Health Workforce.” (Namibia; Gabrielle O’Malley, Norbert Forster, Laura Brandt, and Gillian O’Bryan) Describing the adaptation, implementation, and expansion of the first ECHO program in Africa, this abstract presents results of the mixed-methods evaluation of the Namibia pilot period.